watchOS 2 App Development Essentials Print and eBook (ePub/PDF/Kindle) editions contain 35 chapters. A WatchKit glance is an optional additional scene intended to provide a quick and lightweight view of the key information provided by a WatchKit app. A WatchKit app can have only one glance scene, which is non-interactive and non-scrollable. Tapping the screen while a glance is displayed opens the corresponding WatchKit app. This chapter will provide an overview of WatchKit glances. The next chapter, entitled A WatchKit Glance Tutorial, will provide a practical implementation of a glance scene for an existing WatchKit app. A WatchKit glance is an optional scene that can be added to a WatchKit app. Glances are accessed on the Apple Watch device by performing an upward swipe starting at the bottom of the device display. Glances are displayed in a page-based navigation format allowing the user to swipe left and right to navigate through the glance scenes for the various apps installed on the watch. WatchKit scenes are intended to show only a subset of the information provided by the WatchKit app and containing iOS app and cannot contain interactive controls such as buttons, sliders or switches. Since glance scenes are non-scrollable it is also essential that the information displayed by the glance fit onto a single screen. The only user interaction supported in a glance scene is a tap to launch the corresponding WatchKit app. When a WatchKit app is launched via its glance scene, context information can be passed from the glance to the WatchKit app. A glance should be designed to display the minimum amount of information necessary to inform the user and do so as quickly as possible. A WatchKit glance consists of a scene and a corresponding interface controller derived from the WKInterfaceController class, essentially mirroring the architecture of a standard WatchKit scene. The glance scene is contained within the same storyboard file as all the other scenes within a WatchKit app and the glance interface controller resides within the WatchKit extension. The lifecycle of the glance interface controller is the same as that of any other interface controller as described in the chapter entitled An Overview of WatchKit App Architecture. A key difference between a glance interface controller and the interface controller for a standard scene is that the operating system will call the initialization lifecycle methods earlier for a glance controller, allowing for a greater amount of time to elapse between the init and awakeWithContext initialization lifecycle method calls and the call to willActivate lifecycle method immediately before the scene is shown to the user. It is recommended, therefore, that the willActivate method be used within glance interface controllers to perform a final check that the information being displayed to the user is still up to date before the scene appears to the user. 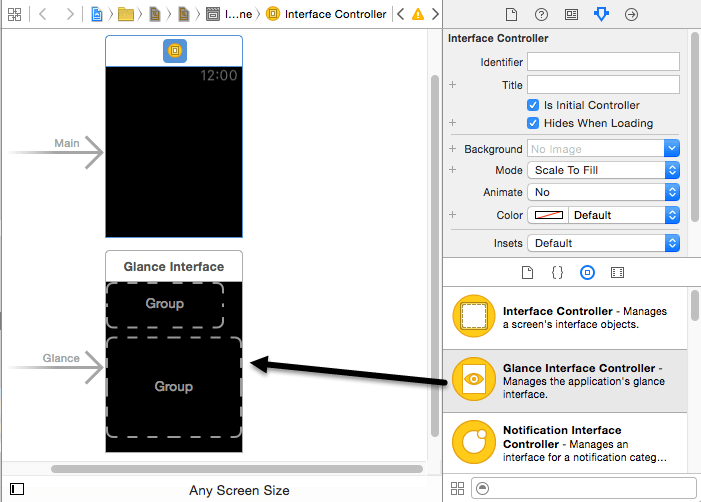 In addition to the scene, Xcode will also add a corresponding interface controller source file to the WatchKit extension named GlanceController.swift and associate it with the glance storyboard scene. The last element automatically added to the project by Xcode is a new build scheme configured to compile and run the glance scene. 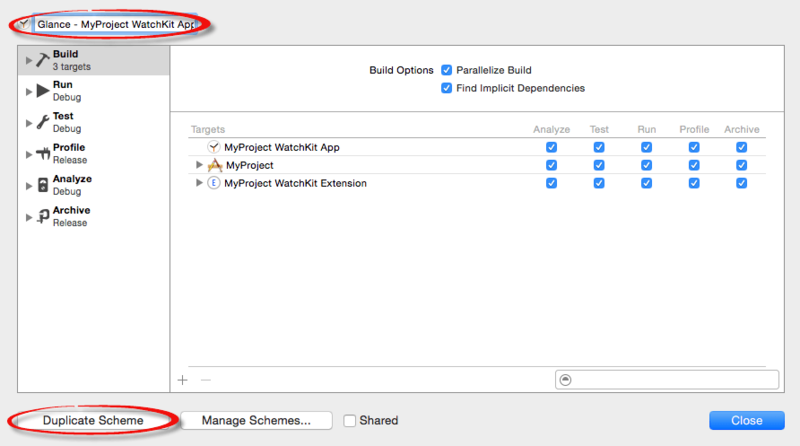 This build scheme appears as an option within the Xcode run target menu as shown in Figure 18-3 and is named Glance - <app name> WatchKit App. Next, add an interface controller to accompany the glance scene by Ctrl-clicking on the WatchKit Extension entry in the Project Navigator panel, selecting the New File… menu option and creating a new Cocoa Touch Class source file subclassed from the WKInterfaceController class. Return to the Interface.storyboard file and select the Glance Interface Controller scene so that it highlights in blue. Display the Identity Inspector panel and select the newly added interface controller class from the Class drop-down menu. With these steps complete the glance is now added and fully integrated into the WatchKit app. When the user taps a glance scene on the watch display the WatchKit app associated with that glance is launched. 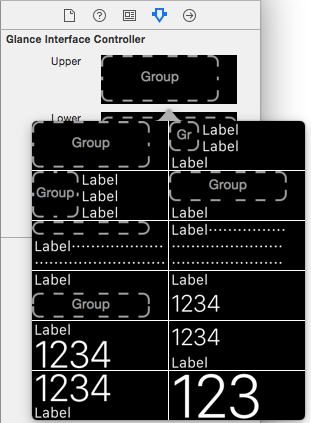 In some situations it might be useful to pass some context data from the glance interface controller to the initial interface controller of the WatchKit app. Based on this data the appearance of the WatchKit app can then be changed. A WatchKit app consisting of a number of different scenes might, for example, display a particular scene when launched in this way based on the context data passed through from the glance. When called, the handleUserActivity method can extract the context data from the dictionary and decide how to tailor the launch of the app in response. A WatchKit glance is an optional scene that can be added to a WatchKit app. Glances are accessed when the user performs an upward swipe starting at the bottom of the watch display. All of the glances available on the device are displayed using a page-based navigation interface through which the user moves using left and right swiping motions. The purpose of a glance is to provide quick access to a subset of the information provided by the corresponding WatchKit app. Glance scenes are non-scrollable and do not respond to user interaction with the exception that a tap will launch the corresponding WatchKit app. When the WatchKit app is launched from the glance scene, context data may be passed to the initial interface controller of the WatchKit app. 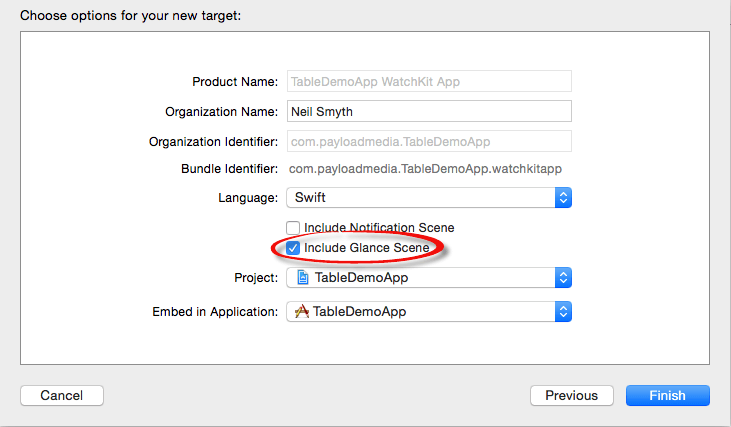 A glance scene may be created either at the point that a WatchKit app target is added to a project, or added manually to an existing WatchKit app extension. 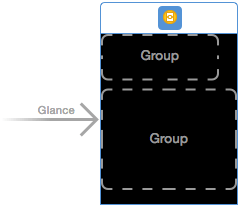 A number of template options are provided within Xcode as the basis for the layout of glance scenes. Glances are intended to launch and display information quickly. To achieve this, the operating system will “pre-initialize” the glance interface controller by making early calls to the two initialization lifecycle methods. Any last minute updates to the data to be displayed should, therefore, be performed immediately before the scene appears within the willActivate method. Tasks that take a long time to complete should be avoided when performing this final update.